SAVANNAH’S GARDEN CITY TERMINAL: groundbreaking on a new rail project is expected soon. Georgia is home to both the single largest container and roll-on/roll-off facilities in North America. The Savannah harbor deepening project has reached the midway point. At the Georgia Foreign Trade Conference, Georgia Ports Authority Executive Director Griff Lynch outlined a plan that will double container handling capacity to 10 million TEUs at Garden City Terminal within 10 years. Lynch reviewed the strategic plan for Georgia’s ports that will allow for 10 million twenty-foot equivalent container units, one-million rail lifts, and more than one-million auto and machinery units per year. Lynch provided an overview of GPA’s 2028 Plan that calls for 42 ship-to-shore cranes, 200 yard cranes, new RTG lanes and significant intermodal expansion in Savannah. The GPA will soon open its second inland terminal in Northwest Georgia and break ground on the Mason Mega Rail project at Garden City Terminal. Combined, both intermodal projects will open new markets while significantly reducing rail crossings and over the road freight through Savannah, Atlanta and beyond. Since Gov. Deal was first elected in 2010, trade through Georgia’s ports has grown from 2.8 million TEUs to more than four-million TEUs in 2017. Ro/ro cargo has expanded from 411,000 units per year to more than 640,000 units, and cargo crossing all docks has grown from 25 million tons in 2010 to 35 million tons in 2017. Lynch announced that Savannah’s outer harbor dredging will be finished in March, bringing the Savannah Harbor Expansion Project to 50 percent completion. 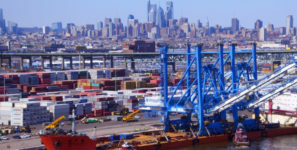 Deepening the inner harbor should be complete by late 2021, allowing neopanamax vessels to take on more cargo and transit the river with greater scheduling flexibility. At the Port of Brunswick, the GPA is well on its way to developing an annual capacity of 1.4 million vehicles. In just the past year, the GPA has spent $25 million to increase roll on/roll off space, and plans to spend another $20 million in the next 18 months to grow and attract additional auto business to Georgia. The GPA plan includes three elements: space, infrastructure and connectivity. To accommodate additional warehousing, the authority has opened five parcels of land at its Savannah International Trade Park for private development. Five miles from Garden City Terminal, the site is quickly expanding to add up to five-million additional square feet of distribution space on five 100-acre parcels. Georgia’s deepwater ports and inland barge terminals support more than 370,000 jobs throughout the state annually and contribute $20.4 billion in income, $84.1 billion in revenue and $2.3 billion in state and local taxes to Georgia’s economy. The Port of Savannah handled 8.5 percent of U.S. containerized cargo volume and 10 percent of all U.S. containerized exports in FY2017.